You can do the kind of workout you like. You're not tied to someone else's timetable, so you can exercise when it best suits you. You can exercise at your own speed and intensity. Instead of talking, you can focus on what you're doing. When a partner is late, it cuts into your exercise time. A friend helps motivate you to do it. It's easier to stick to a schedule. Partners tend to exercise longer and more intensely. Did I say it's more fun? 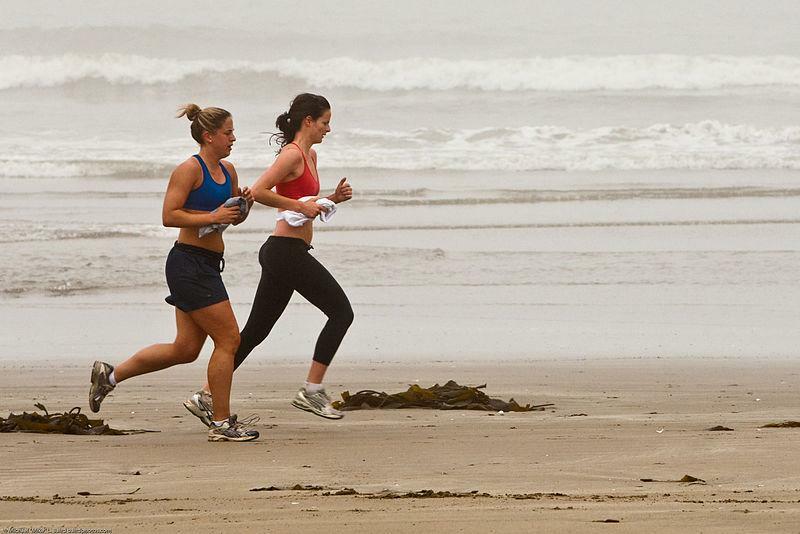 Although researchers generally agree that exercise provides many benefits for both physical and mental health, including reduced risks of cardiovascular disease, hypertension, diabetes, cancer, and obesity, as well as a reduction in anxiety and stress, they rarely give any hard and fast recommendations on whether to exercise solo or with a friend. The goal of a recent study published in the Journal of Social Sciences was to examine how social comparisons might impact an individual's level of exertion and mood during an exercise routine with a high-fit or low-fit partner. Ninety one college students at Santa Clara University were randomly assigned to one of three conditions: biking alone, biking with a partner perceived as "high-fit," or biking with a partner perceived as "low fit." All participants were instructed to complete 20 minutes of exercise at 60-70 percent of their maximum target heart rate. The researchers predicted, based on social comparison theory, an outcome where participants would gravitate toward the behavior (high-fit or low-fit) of their partner. Social comparison theory states that "humans have a drive to assess how they are doing and in order to assess how they are doing, they seek standards against which to compare themselves. When objective standards are not available, people look to their social environments and engage in comparison with available others." More simply put, we decide our worth based on how we stack up against others. Sure enough, in keeping with social comparison theory, results indicated that participants matched with the high-fit partner exercised harder than those matched with a low-fit partner. So, this study answers the question of whether it's better to exercise with a partner with a conditional "yes" - only if your partner is in better condition than you. Oddly, the researchers discovered no differences in mood emerging between the various conditions. Choosing to exercise with a partner, this study suggests, will not necessarily brighten your mood. Plante TG. Madden M, Mann S, Lee G, Hardesty A, Gable N, Terry A, Kaplow G. Effects of Perceived Fitness Level of Exercise Partner on Intensity of Exertion. Journal of Social Sciences. 2010; 6:1. http://my.psychologytoday.com/files/attachments/34033/jssarticle.pdf. Accessed May 10, 2013.